Al Gore has 3 media appearances. Al Gore discusses Earth in the Balance. Warwick’s and the San Diego Law Library present former Vice President Al Gore. On Sunday, February 10, 2013 at 7:30 pm, at the Mandeville Auditorium on the UCSD Campus, Mr. Gore will discuss his newest book The future: Six Drivers of Global Change, followed by a Q&A and book signing. This is a ticketed event, please call the Warwick's Book Dept. (858) 454-0347 or click here to purchase. Ticket Info: Tickets for this event have sold out. Please note: Please note that paper tickets must be presented at time of entry. You may pick-up your copy of the book between January 29th and February 8th at Warwick's, 7812 Girard Ave., La Jolla or at the event on February 10th, starting at 6:00pm. You must present your paper ticket in order to receive your book. From the former vice president and #1 New York Times bestselling author comes "An Inconvenient Truth" for everything--a frank and clear-eyed assessment of six critical drivers of global change in the decades to come. With the same passion he brought to the challenge of climate change, and with his decades of experience on the front lines of global policy, Al Gore surveys our planet's beclouded horizon and offers a sober, learned, and ultimately hopeful forecast in the visionary tradition of Alvin Toffler's Future Shock and John Naisbitt's Megatrends. 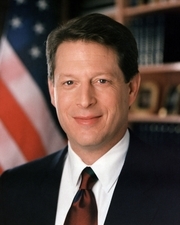 In The future, Gore identifies the emerging forces that are reshaping our world: - Ever-increasing economic globalization has led to the emergence of what he labels "Earth Inc."--an integrated holistic entity with a new and different relationship to capital, labor, consumer markets, and national governments than in the past. - The worldwide digital communications, Internet, and computer revolutions have led to the emergence of "the Global Mind," which links the thoughts and feelings of billions of people and connects intelligent machines, robots, ubiquitous sensors, and databases. - The balance of global political, economic, and military power is shifting more profoundly than at any time in the last five hundred years--from a U.S.-centered system to one with multiple emerging centers of power, from nation-states to private actors, and from political systems to markets. - A deeply flawed economic compass is leading us to unsustainable growth in consumption, pollution flows, and depletion of the planet's strategic resources of topsoil, freshwater, and living species. - Genomic, biotechnology, neuroscience, and life sciences revolutions are radically transforming the fields of medicine, agriculture, and molecular science--and are putting control of evolution in human hands. - There has been a radical disruption of the relationship between human beings and the earth's ecosystems, along with the beginning of a revolutionary transformation of energy systems, agriculture, transportation, and construction worldwide. From his earliest days in public life, Al Gore has been warning us of the promise and peril of emergent truths--no matter how "inconvenient" they may seem to be. As absorbing as it is visionary, The future is a map of the world to come, from a man who has looked ahead before and been proven all too right. This event will be held at the Pasadena Civic Center Ballroom/ Exhibit Hall 300 East Green Street, Pasadena. Ours is a time of revolutionary change that has no precedent in history. With the same passion he brought to the challenge of climate change, and with his decades of experience on the front lines of global policy, Al Gore surveys our planet's beclouded horizon and offers a sober, learned, and ultimately hopeful forecast in the visionary tradition of Alvin Toffler's Future Shock and John Naisbitt's Megatrends. In The future, Gore identifies the emerging forces that are reshaping our world. This is a ticketed event: Ticket +book: $40.00 +tax Tickets for the event are now available at the main store and Vroman's Hastings Ranch locations, as well as online. All online ticket orders must be received by 5pm on Saturday, February 9. All phone orders must be received by 10pm on Saturday, February 9. Tickets & books will be available at the venue the day of the event, while supplies last. Customers who purchase their tickets online will need to bring their printed online order receipt to the Will Call tables at the Civic Center the day of the event to receive their event ticket and one (1) copy of The future. Event Guidelines: (Updated 1/22/13) - This is a general admission event. - Mr. Gore will sign all purchased copies of The future. Limit 4 per person. - No personalizations. - No photos or recording allowed at event or during the signing. - Mr. Gore will not sign copies of his previous books or memorabilia. For more information or questions, please call (626) 449-5320. *Click here if you only wish to purchase a copy of The future (this does NOT include an event ticket). The St. Louis County Library presents "An Evening with Al Gore." With the same passion he brought to the challenge of climate change, and with his decades of experience on the front lines of global policy, Al Gore offers a sober, learned and ultimately hopeful assessment about the emerging forces reshaping our world. Ticket packages include a pre-signed copy of his new book, The future. Left Bank Books will also have additional pre-signed copies for sale at the event. For more details or to purchase tickets, visit brownpapertickets.com or Library Headquarters. Al Gore is co-founder and chairman of Generation Investment Management and The Climate Reality Project, a nonprofit organization committed to solving the climate crisis. He was elected to the U.S. House of Representatives four times and to the U. S. Senate twice, and he served as Vice President of the United States from 1993 to 2001. A co-recipient of the 2007 Nobel Peace Prize, he is the author of five books, including Earth in the Balance, An Inconvenient Truth, Assault on Reason, Our Choice, and his newest book, The Future, which examines six critical forces that are reshaping our world. Al Gore is currently considered a "single author." If one or more works are by a distinct, homonymous authors, go ahead and split the author. Al Gore is composed of 2 names. You can examine and separate out names.